So awesome, where’ed you learn to draw anyway? Drawing all my life, and then I majored in Art (and English) in college. Like it. 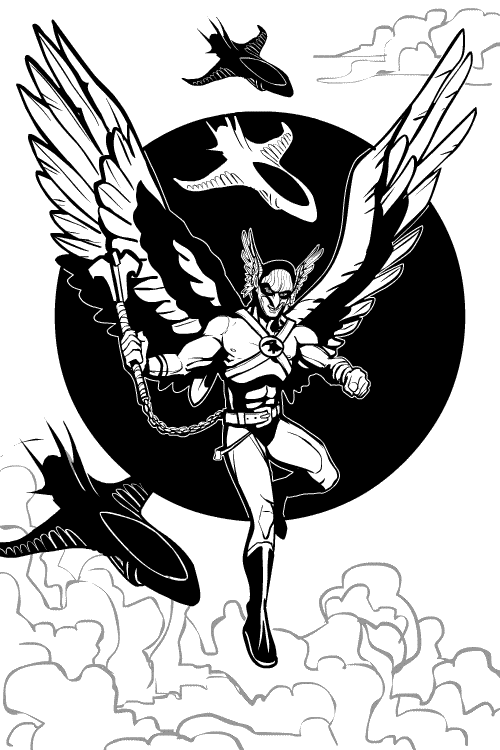 My problem with Hawkman is that he is a flyer who uses a melee weapon. That make sense to anyone? Yes, birds of prey swoop to get a meal. But a flying sentient being? I’d be all about range weapons. Use my ability to fly to set a position, quick shot, and post-haste. Reading too much Jane’s Defence lately. Love it! And Nick, I’m not the best artist, but I’m among the few in my school with art talent. And what you have to do is keep practicing, learn a good technique, and don’t grind your pencil into the paper like many people I know. Let your pencil sweep and fluidly make curves. Use yourself as a posing model if you attempt a pose, and never make a line so dark that you can’t erase unless you’re perfectly happy with it. But years of drawing is your best bet at it. Realsim, use the technique I posted above. If you want a cartoon, use a lot of recognizable shapes and keep it round and squigly, although I don’t think of myself as a cartoonist. I’ve tried, and I’m much better at realism. But, never, ever, give up, and always keep at it, and you’ll be amazed. Some people need a model, and some do it off of their head. I think I am personally better at imagining, because I don’t f*ck up the proportions. But back to your drawing Jeff. This one beats out most of its predececors. The wings and wood-like helmet pattern add a picture-perfect, detailed effect, while keeping it in balance with the unrealisticness of a man flying. The backround circle, while uneccesary in my opinion, add a comicky effect, with the black and white jets. His pectorals and abdominals are expertly formed, and the belt adds a cool touch, with the muscular legs to top (bottom) it off. Nice one, Jeff-O. And last but not least, the clouds are beautifully added, making it as if the clouds aren’t even there, but are a needed portion. Best in a while here!